The ipv6 protocol is designed to replace ipv4. Where ip version 4 supports a maximum of four billion unique addresses, ip version 6 expands this to four billion times four billion times four billion times four billion unique addresses. This is more than 100.000.000.000.000.000.000 ipv6 addresses per square cm on our planet. That should be enough, even if every cell phone, every coffee machine and every pair of socks gets an address. The ipv6 localhost address is 0000:0000:0000:0000:0000:0000:0000:0001, which can be abbreviated to ::1. The above address has 64 bits for the host id, theoretically allowing for 4 billion times four billion hosts. ipv6 addresses starting with fe8. can only be used on the local segment (replace the dot with an hexadecimal digit). This is the reason you see Scope:Link behind the address in this screenshot. This address serves only the local link. These link local addresses all begin with fe8..
Every ipv6 enabled nic will get an address in this range. The now obsolete system of site local addresses similar to ipv4 private ranges is replaced with a system of globally unique local ipv6 addresses. This to prevent duplicates when joining of networks within site local ranges. Since ipv6 was designed to have multiple ip addresses per interface, the global ipv6 address can be used next to the link local address. These globally unique addresses all begin with 2... or 3... as the first 16-bits. 6to4 is defined in rfc's 2893 and 3056 as one possible way to transition between ipv4 and ipv6 by creating an ipv6 tunnel. You can use the command below to convert any ipv4 address to this range. Should you be so lucky to get an ipv6 address from an isp, then it will start with 2001:. Comparable to example.com for DNS, the following ipv6 address ranges are reserved for examples, and not routable on the internet. Use ping6 to test connectivity between ipv6 hosts. You need to specify the interface (there is no routing table for 'random' generated ipv6 link local addresses). Below a multicast ping6 that recieves replies from three ip6 hosts on the same network. A lot of information on ipv6 in Belgium can be found at www.ipv6council.be. 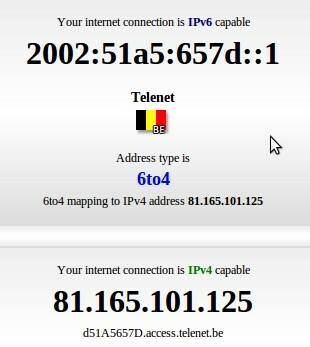 Sites like ipv6.belgium.be, www.bipt.be and www.bricozone.be are enabled for ipv6. Some Universities also: fundp.ac.be (Namur) and ulg.ac.be (Liege). Going to the ipv6-test.com website will test whether you have a valid accessible ipv6 address. Going to the test-ipv6.com website will also test whether you have a valid accessible ipv6 address. To access ipv4 only websites when on ipv6 you can use sixxs.net (more specifically http://www.sixxs.net/tools/gateway/) as a gatway. Below a screenshot of a ping6 from behind a 6to4 connection. Below a screenshot of a tcp handshake and http connection over ipv6. As seen in the DNS chapter, ipv6 PTR records are in the ip6.net domain, and have 32 generations of child domains. Below a transcript of a 6to4 setup on Linux. Thanks to http://www.anyweb.co.nz/tutorial/v6Linux6to4 and http://mirrors.bieringer.de/Linux+IPv6-HOWTO/ and tldp.org!